Distinguishing Characteristics Hispanic female. Red hair, brown eyes. Maria may dye her hair brown. She has a gold-filled window crown on one of her front teeth, and her ears are pierced. She is a native of Belize and her maiden name is Bobadilla. Maria lived in Huntsville, Texas with her husband, James Kimbrell, at the time of her disappearance. He told her family she left for a trip to Honduras with a friend on June 19, 1991, in order to do some research for school. She was a criminology student at Sam Houston State University at the time of her disappearance. Maria has never been heard from again. There is no evidence that she actually went to Honduras, and she left all her personal belongings behind, including clothes, toiletries, credit cards and her car. She had previously taken three-day trips to her native Belize, but would always say goodbye to her young son. This time she left without a word to him. Shortly after Maria disappeared, James took their son and moved. They lived reclusively after this; they had no phone, no credit cards, and James and Maria's son was home-schooled. Family and friends were allowed to visit, but were not allowed to mention Maria. Maria was well-known to the security forces in Belize; she had led protest parties there supporting the United Democratic Party, which was in opposition to the ruling party, the People's United Party. She and James were also involved in other activist groups, such as the Belize Humanitarian Alliance. There was a theory that Maria's disappearance was a politically motivated kidnap/murder, but there is no evidence to support that. James died in 1998. His daughter by a prior relationship believes he probably murdered Maria, but he was never charged in her case or named as a suspect. 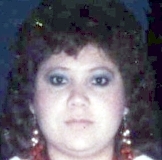 Maria's case remains unsolved. Updated 3 times since October 12, 2004. Last updated February 8, 2019; distinguishing characteristics and details of disappearance.